For more information check out the ypclient-pro user manual. 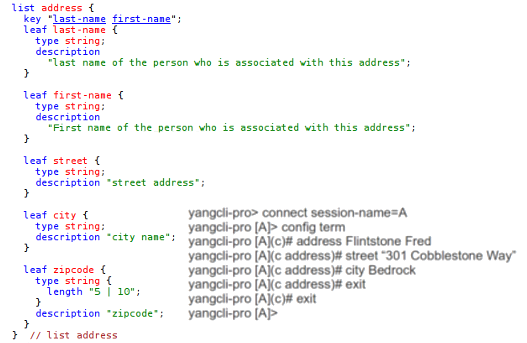 All local commands are derived from YANG rpc statements found in yangcli-pro.yang. These are converted from YANG and used directly by the command interpreter. All remote commands are derived from the YANG rpc statements in the YANG modules advertised by the NETCONF server. These are converted to messages sent to the NETCONF server for processing. All command processing is automated, so no special configuration is needed to use any NETCONF operation on any NETCONF server that supports YANG. When a NETCONF session is started, both the client and the server send a message. The client uses this message to determine the exact set of YANG modules supported by the server. The YANG features (representing optional features) are applied so unsupported objects are removed from the session. The YANG deviations (representing platform-specific differences in particular YANG objects) are also applied as patches to the YANG modules used for the session. This allows the yangcli-pro program to automatically customize the CLI for each NETCONF session. The YANG annotations (extension statements) allow the CLI engine to handle special program behavior than cannot be expressed in standard YANG statements. If the yangcli-pro program cannot find a YANG module advertised by the server in its YANG library, it will try to get it from the server. If a server (such as netconfd-pro) supports the operation, then the module will be retrieved and used for the session. Each user has their own CLI interface environment, allowing the yangcli-pro program to be customized and utilized independently. The named sessions are saved in the sessions configuration file with the session-cfg command. Named session configurations can be recalled for easy reuse. The session name is also used to switch between sessions when many are active at once. The capability manager analyzes the list from the NETCONF server message and adjusts the remote operations accordingly. The server target database (candidate or running) is determined from these capabilities as well. The get-locks, release-locks and save commands can be used to simplify NETCONF operation regardless of server profile. 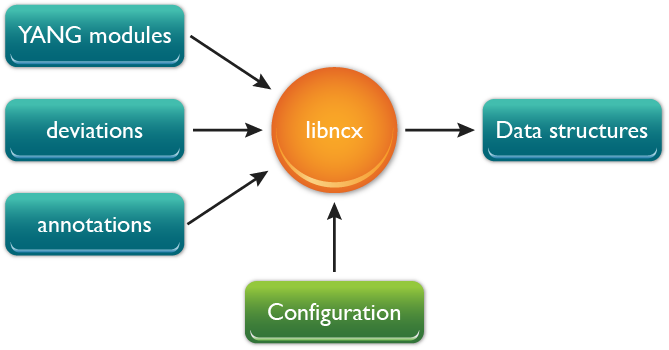 The session manager adjusts these procedures based on the databases supported by the NETCONF server. The handler processes the replies from the NETCONF server and dispatches it to the appropriate sub-systems for inspection and further processing. The config shadow feature allows the CLI command interpreter to customize the command completion and other behavior, based on the contents of the configuration for the NETCONF server. The notification handler automatically starts monitoring notifications from the NETCONF server if supported. Standard events such as netconf-config-change can be monitored to help keep the session state up to date. The NETCONF converter automatically converts CLI commands to the most appropriate NETCONF operations for the session. For example, the ‘remove’ operation attribute value is used only if the server supports it. The protocol version (base:1.0 or base:1.1) and other capabilities are used to automatically construct the best message to use for each server. Simple script files can be saved and edited with any text editor. Comments and multi-line commands are supported, and any local or remote commands (including running other scripts) are allowed. The script search path can be controlled independently for each user. Scripts can be passed up to 10 parameters (P1 to P10) and each script can have its own local variables. Powerful user variables allow simple or complex YANG data structures to be saved for reuse. Variables can be set to simple values or the data returned from a NETCONF message. The system variables are derived from environment variables and CLI parameters. They allow users to inspect all parameter values and change CLI settings at runtime. 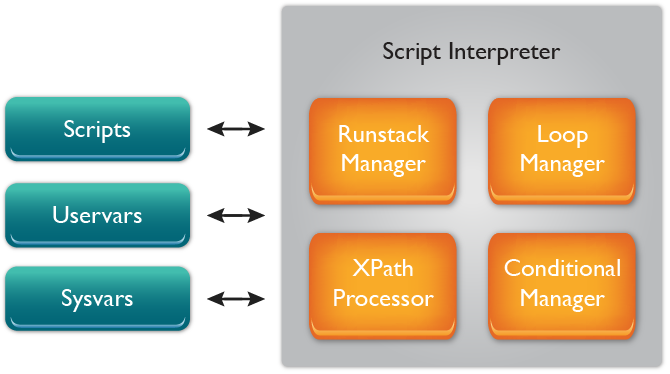 The runstack manager maintains command and variable contexts for the scripts running within the current session. It allows scripts to be called from the currently running script. Recursion is allowed if called from within a conditional statement. The XPath processor allows simple or complex XPath expressions to be used to control ‘while’ loops and ‘if’ statements. Variables can also be assigned the result of an XPath expression. All system and user variables are visible within the XPath interpreter, along with all standard and some custom XPath functions. 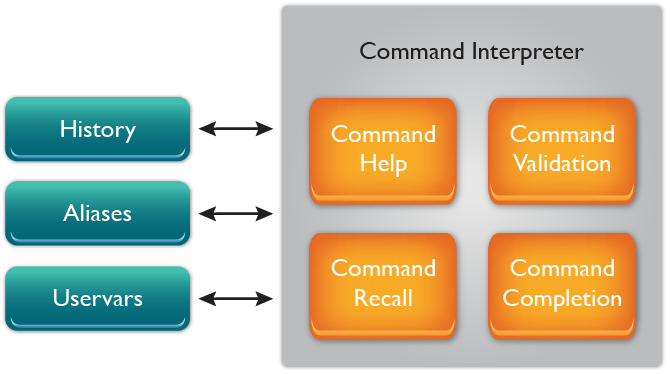 The loop manager keeps track of interactive or script loop contexts and automatically records and replays the enclosed commands until the loop exit condition is met. The conditional manager processes conditional command blocks entered with the if, elif, and else commands. These commands can be nested and conditions are specified with XPath expressions. Reusable test template files can be saved and edited with any text editor. They can also be saved automatically with the record-test command. The record-test handler allows regression tests to be recorded interactively. Test recordings can be saved, paused, resumed, or canceled. 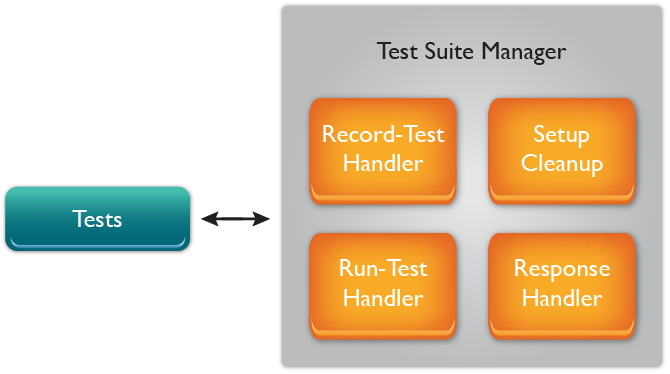 Each test suite can have multiple tests and each test can have multiple steps. The run-test handler is used to run the test-suite command using data from recorded tests and the tests file. It saves and reports results. Test pre-requisites can be specified, allowing some tests to be skipped unless the dependency tests have been run and passed. The setup and cleanup features allow CLI command blocks to be used to automatically initialize a test suite when it is started and cleanup when it terminates for any reason. The response handler analyzes local command results or contents from remote commands and determines if the correct response has been received. Either ok, data, or error responses can be checked, based on the test template. Data can be saved with record-test and compared against responses received during a test. Specific error-tag and error-app-tagvalues can be checked for negative test cases. Multiple NETCONF sessions can be active at once, allowing interactive, user script, and test suite access to multiple servers at once. Session configuration can be saved as named sessions. These saved sessions can be loaded manually or automatically, greatly simplifying the connect command. 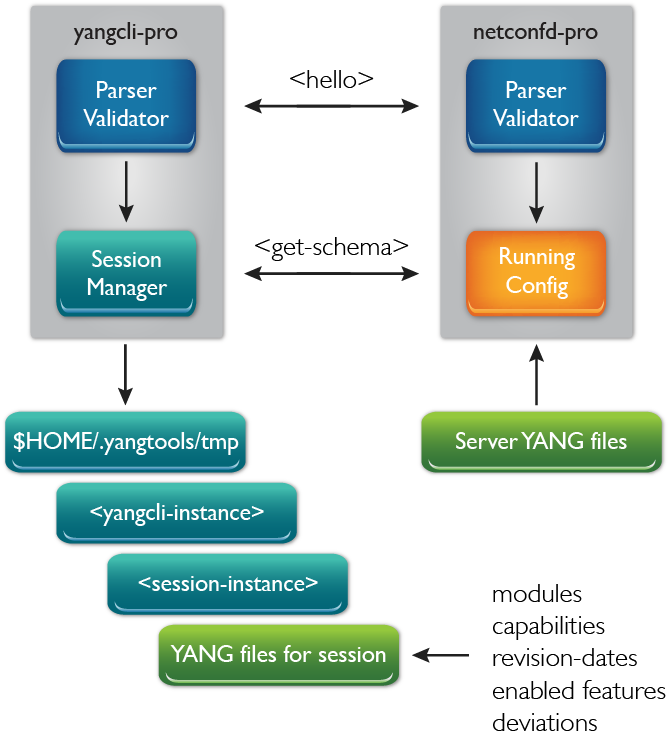 Any YANG module can be loaded into yangcli-pro and used right away. All rpc statements are automatically available as commands. All data statements are automatically available as database content or monitoring data. When a NETCONF session is started, the server statements can be used to compile the YANG modules exactly as that server is using them, so yangcli-pro can tailor the user interface independently for each session. When a NETCONF session is started, a copy of the server’s running configuration can be automatically cached for CLI tab completion and other operations. When a NETCONF session is started, notification monitoring can be started automatically. Various notifications are monitored, such as configuration change events to force shadow configuration caches to be properly updated. The high-level get-locks and release-locks commands allow all configuration locks for a NETCONF session to be managed automatically. Unix-style command aliases allow user command short-cuts to be defined to save typing. Powerful system variables can be used to change CLI parameters at run-time and user variables can be used to save almost any kind of data for reuse in commands, scripts, and tests. Data can be read and stored in XML or text files instead of data variables, allowing off-line tools to generate data for tests. Commands can be stored in text files and run automatically as scripts. Parameters can be passed to scripts. Scripts can call other scripts. Aliases, data variables and file variables can be used. The if and while commands use XPath to allow customized conditional commands to be programmed into scripts. All data variables are available as XPath variables in these expressions. The test-suite feature allows text test-suite configuration files to be used to control automated server regression testing. A test suite contains 0 or more tests with 0 or more steps. Test dependencies can be defined to prune tests that cannot be run on the test server. If a test step send an operation to a NETCONF server, any type of reply can be expected, including . Specific error fields can also be checked. If a test step send an operation to a NETCONF server, a data reply can be expected. These data replies can be checked against a saved control response. Tests can contain command for multiple sessions to test locking scenarios, editing collisions, etc. Formatted test results can be generated and saved to a special log file. 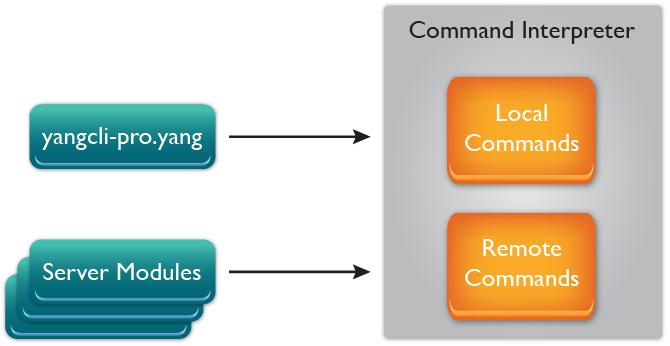 The help command provides context-sensitive, user-friendly help text derived directly from YANG modules. Pressing the tab key during interactive command line editing will cause a context-sensitive list of word completions to be displayed. List key values are fetched from the shadow configuration if available. Variable names and many other new tab completion features are supported. Command and data parameters can be entered in any order. However, YANG lists and leaf-lists that are ordered-by usershould be entered in the desired order. Commands and data that are entered in interactive mode will be checked for any missing mandatory parameters. If so, the user will be prompted to fill in any missing parameter values, 1 at a time. Any conditional YANG constructs like if-feature or when statements are automatically checked when a command is invoked so unsupported fields are not shown to the user. Enter new configuration mode similar to router CLI interfaces, allowing configuration data to be edited directly. Manage automatic recording of regression tests for replay with the test-suite command. Change the current session when multiple concurrent sessions are active. 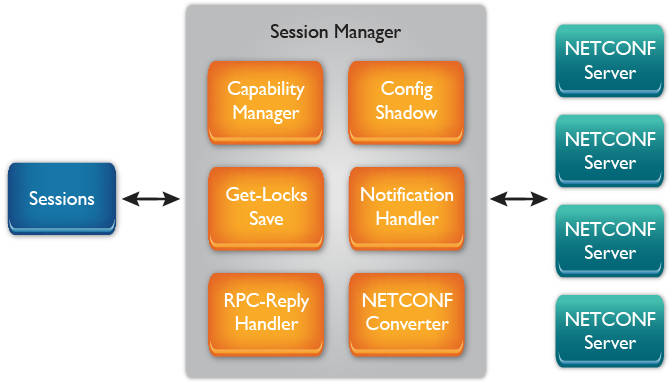 Manage the specified named session configuration. Manage the named session configuration files. Start simplified recording of RPC timing statistics. Stop simplified recording of RPC timing statistics and save the data in a gnuplot compatible file. Gracefully terminate a named session. Manage the regression test suite feature. Update the shadow configuration for the current session.